In May we visited Istanbul for the first time we loved it from the moment we landed. 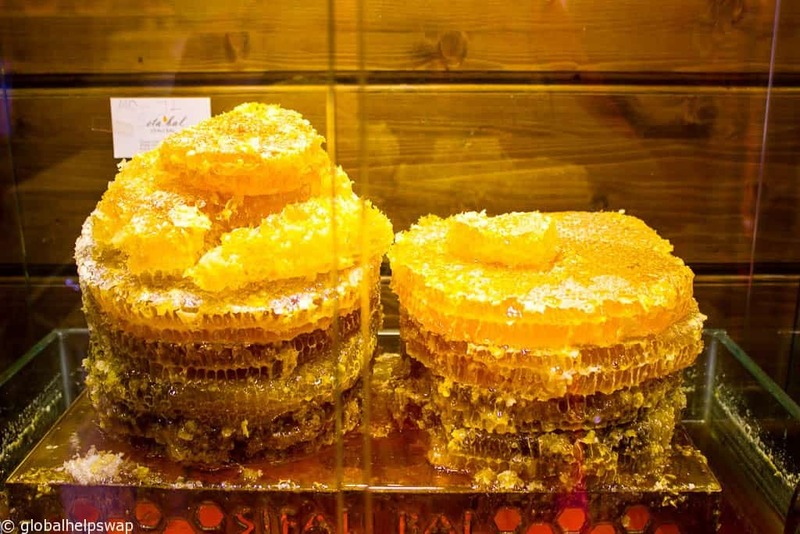 There is a buzz to the city that is highly infectious. It felt like people lived their lives on the street. From reading the paper over a morning coffee to late night drinks and food, the locals never seemed to go home. As a traveller visiting a new city there is nothing more exciting than buzz of locals busy living their lives. 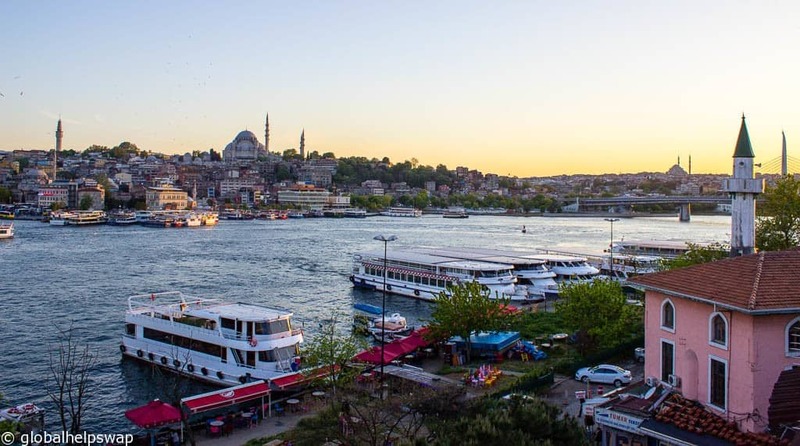 It was very easy to see why Istanbul became one of the most important cities on earth. Sitting right on the borders between Asia and Europe, the city is located at the crossroads of world religions, culture, trade and commerce. The city has an ancient feel but with a modern vibe. It reminded me a lot of Rome with its ancient buildings sitting right next to a modern office block. 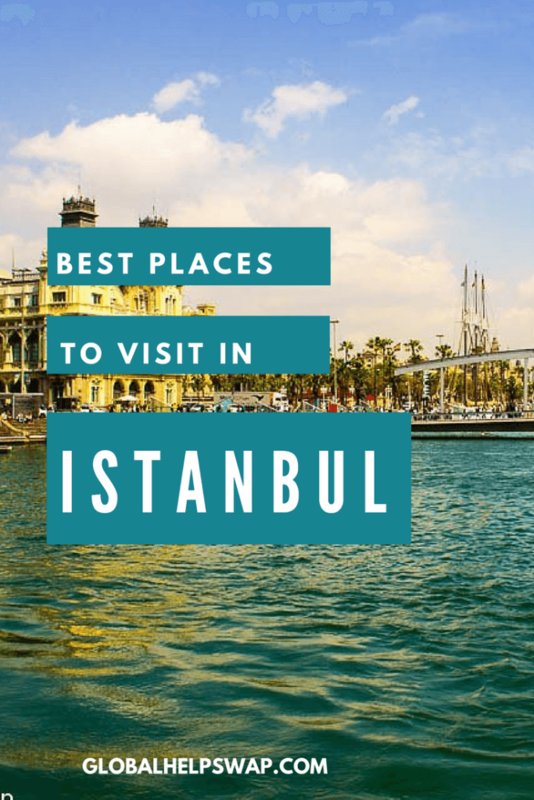 Below is a list of places to visit in Istanbul. We visited most of them with Walks of Turkey a company we highly recommend using. 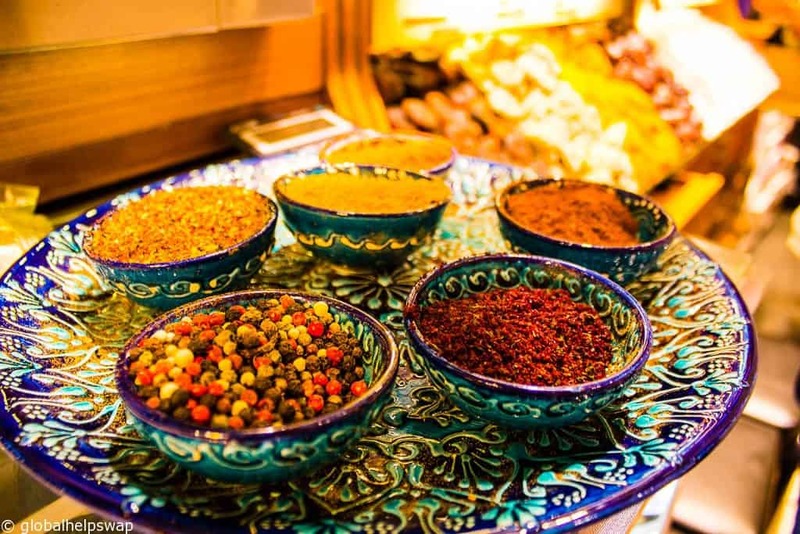 They have brilliant local guides, (in fact I would say that our guide on the Istanbul in a day tour was the best guide we have ever come across,) you are in small groups and you get to skip the huge queues that form at all the popular spots. The best part is that these tour guides are so passionate and knowledgeable. 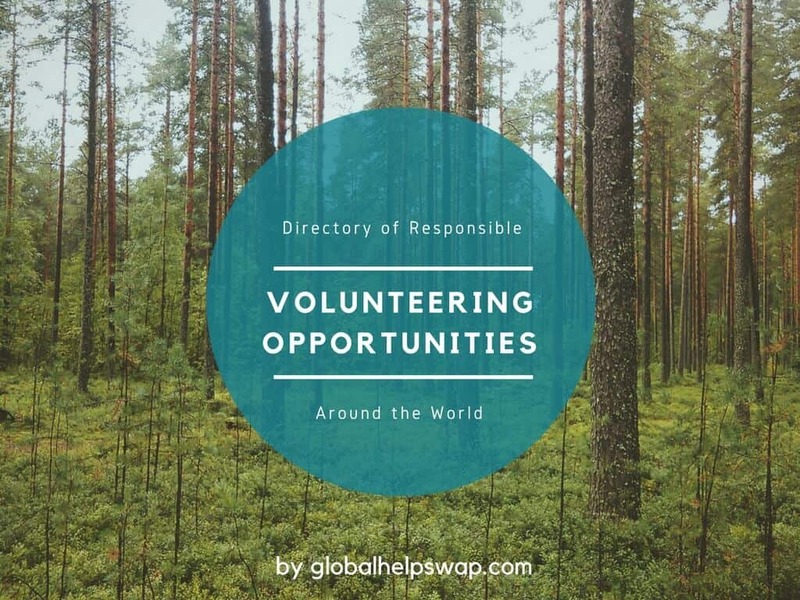 Forget monotone bored descriptions from your guide and instead get ready for amazing stories that truly bring a place to life. 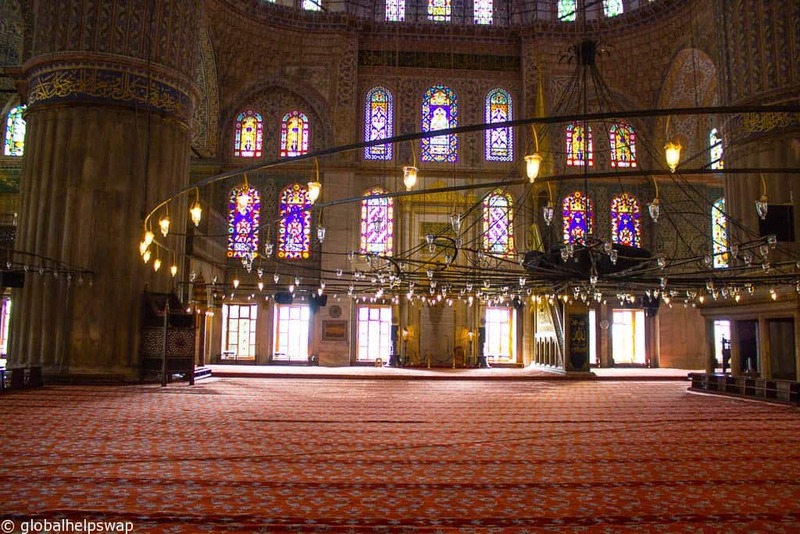 No visit to Istanbul is complete without visiting the fabled Blue Mosque. Completed in 1616 The Sultan Ahmet mosque (its official name) is named after the Sultan who commissioned the building in the 17 th century. 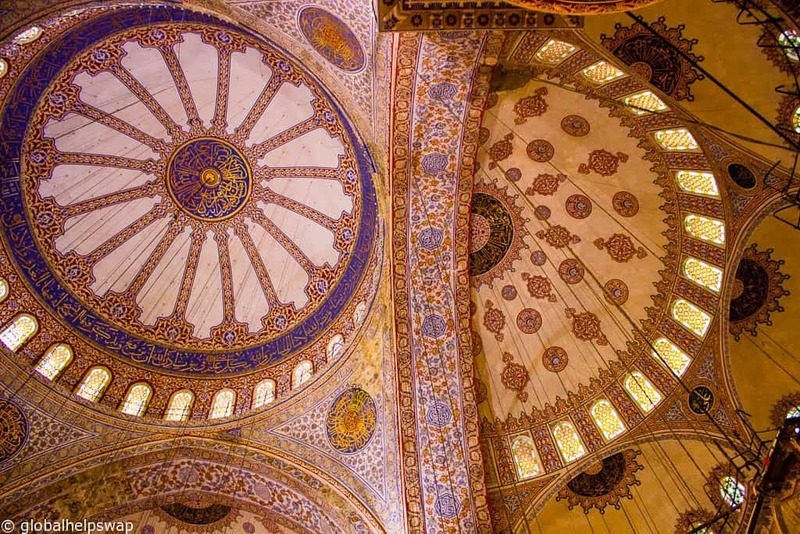 The name the Blue Mosque comes from the blue iznik tiles that adorn the interior. 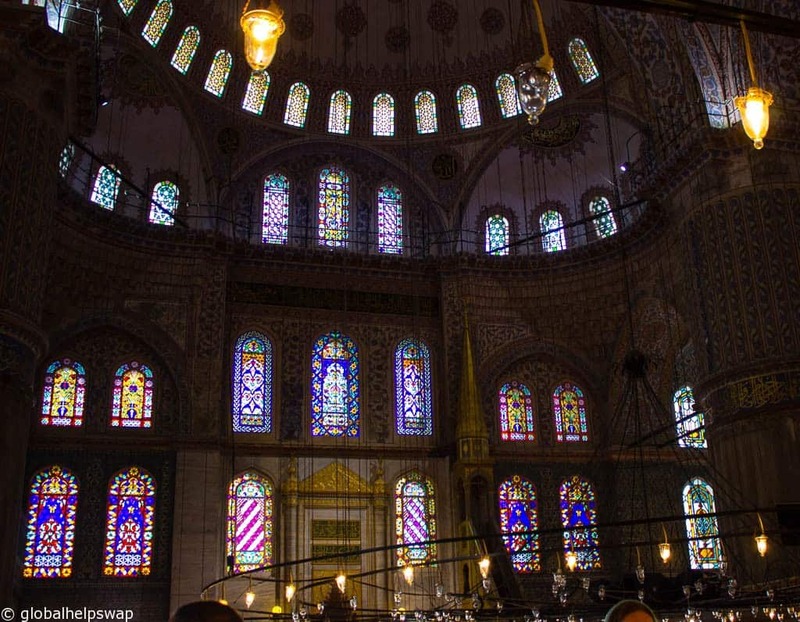 It is one of the world’s most grandest mosques with one main dome, 6 minarets and 8 secondary domes. It can hold up to 10,000 worshipers at one time. I loved the interior of this mosque, the craftsmanship all around us was stunning. Yet, it is done in a subtle way, even with 20,000 handmade tiles and 200 stainglass windows! The mosque is closed to visitors during the 5 daily prayer times. To me this was the most impressive site in all of Istanbul. 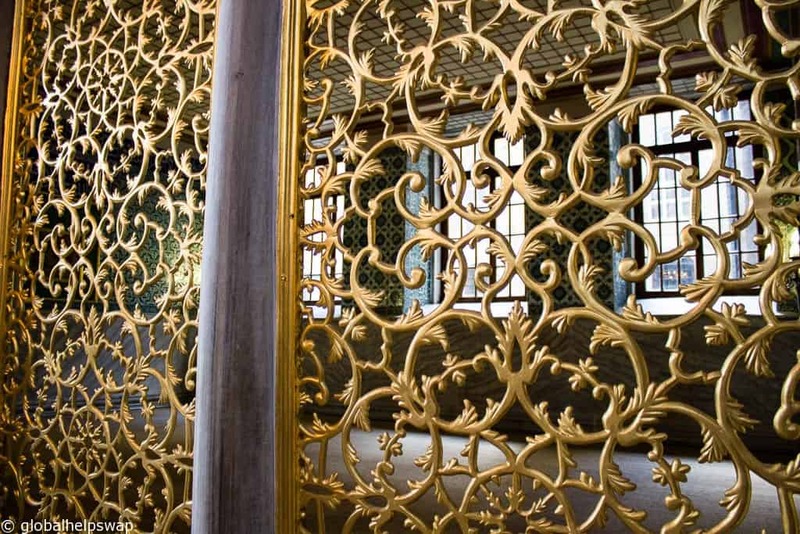 Aya Sofia began life as church in 537, became a mosque in 1453 and finally a museum in 1935. 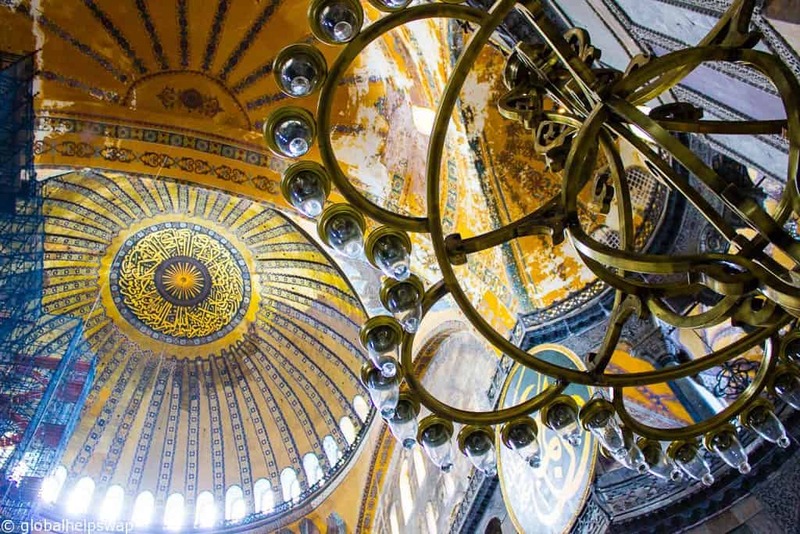 This one building captures the history of Istanbul and Turkey perfectly. From a Christian, to a Muslim to a Secular state. There is so much to see in this wonderful building it was hard to know where to start. This is where our guide came in very handy. It’s one thing appreciating beauty but another thing entirely knowing what that thing of beauty means. Walking around Aya Sofya and seeing the different images of Christianity and Islam is a unique experience. How many times can you say you have walked in a church and a mosque at the same time? And yet, as I walked around I couldn’t help but notice that in the end both religions are very similar. Both religions believe in the same god, both religions believe in the prophets, both follow the 10 commandments and both believe there is a hell and paradise. Of course there are differences but contrary to popular belief most worshipers respect those differences. 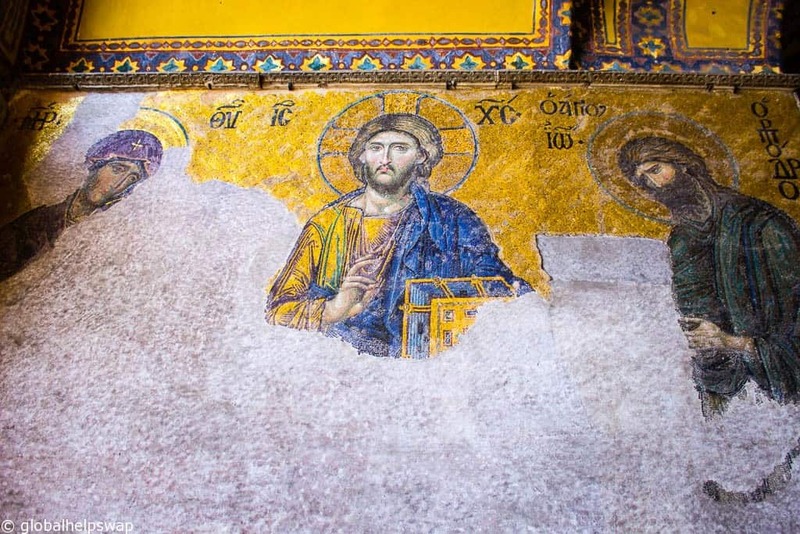 Just like the custodians of Aya Sofya did. 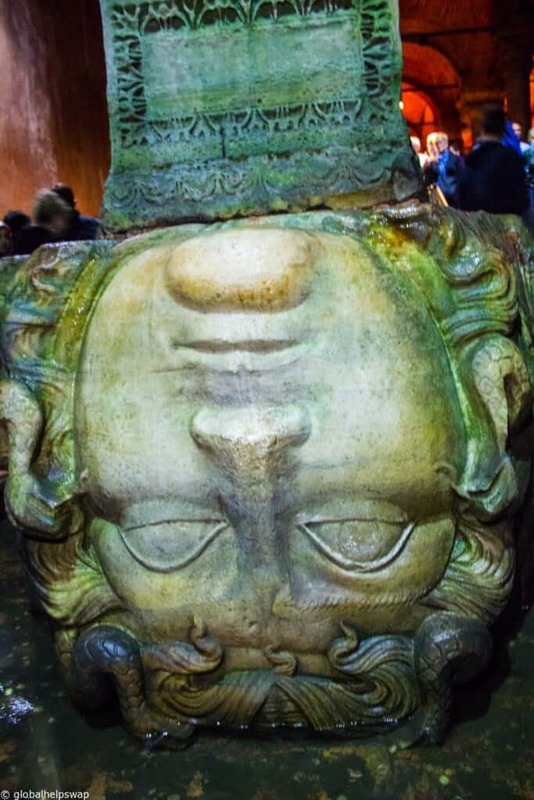 I must admit, before visiting Istanbul I had never heard of the Basilica Cistern. So imagine my delight when we entered this magical place. 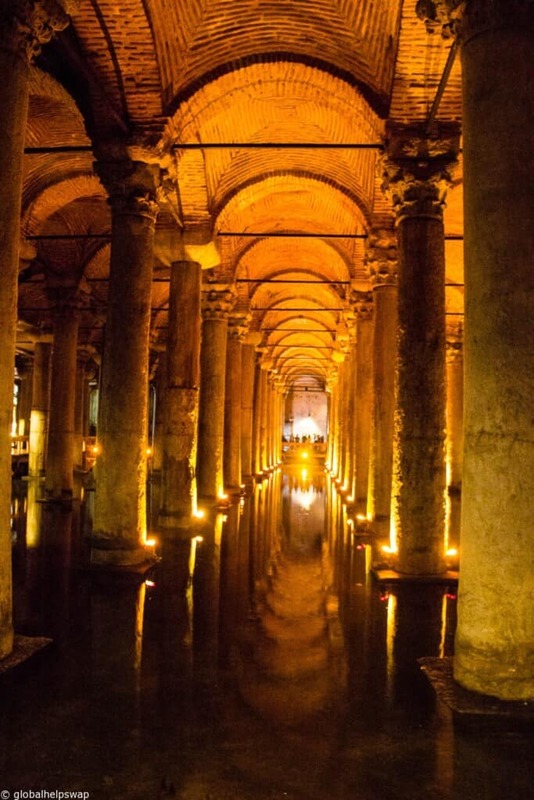 This subterranean structure was commissioned by the Emperor Justinian and built around 532. Most of the 336 columns were salvaged from ruined ancient temples and feature carved symbols all around them. The water in the cistern came from the Black Sea via aqueducts over 20km away. 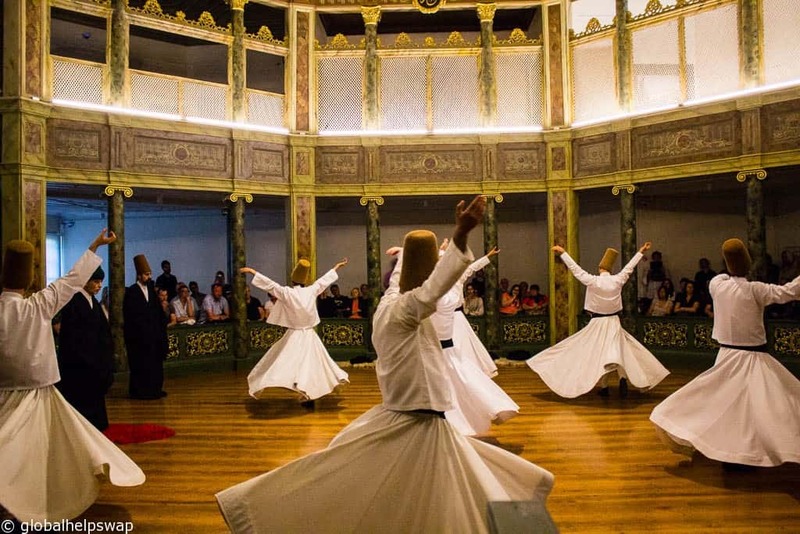 The Sema is a spiritual ceremony performed by the order of the Whirling Dervishes. 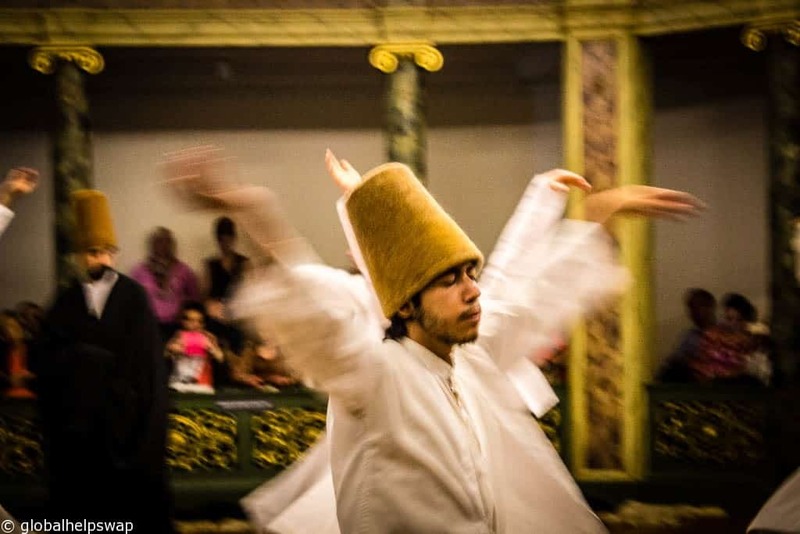 The Dervishes are practitioners of Sufism, a mystical side to Islam that is practiced in various countries around the world. We were lucky to come across a Sema ceremony just as we were finishing our one day tour of Istanbul. We literally were the last two to enter the building before the ceremony began. Even though it looks like a performance, remember this is a religious ceremony. 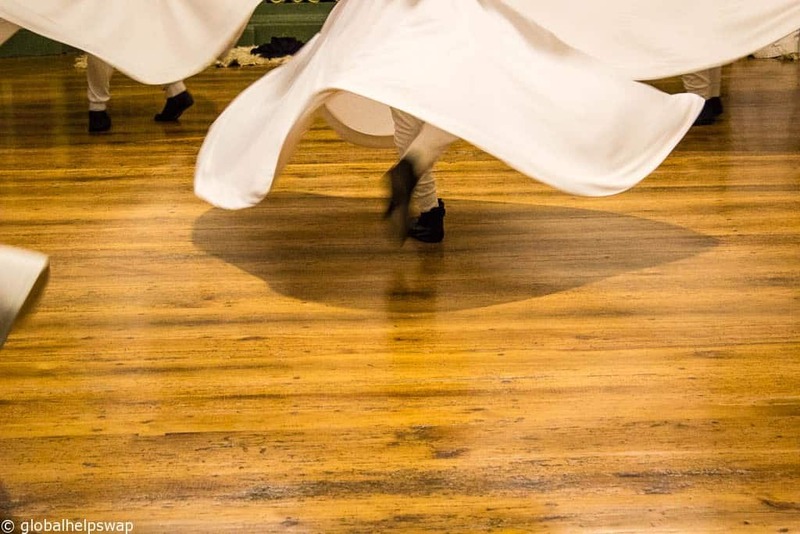 By whirling, the Dervish believe they are reaching a higher connection with God. All I know is, the ceremony is nothing like you will see anywhere else. Imagine spinning around non-stop for up to an hour? How they keep their balance is a mystery to me. It was very hypnotic watching them spin and spin as the musicians chanted verses from the Quran. 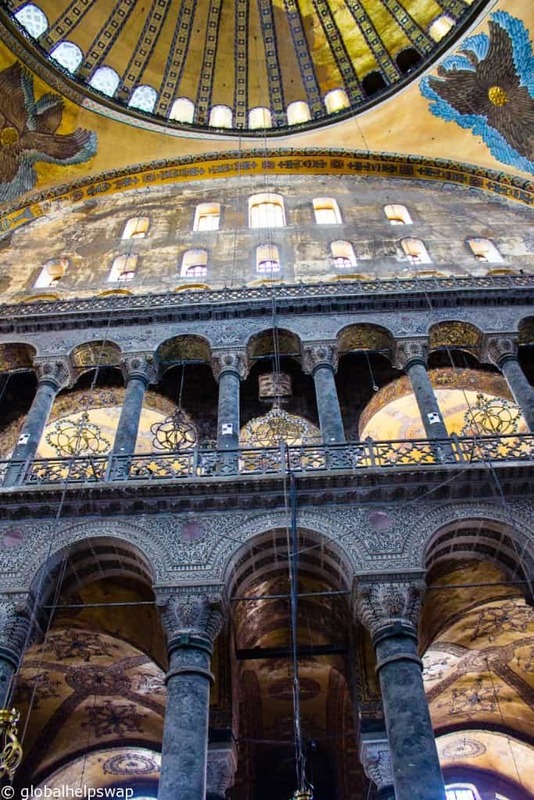 If you are looking for a glimpse of the past in modern-day Istanbul, this ceremony is for you. 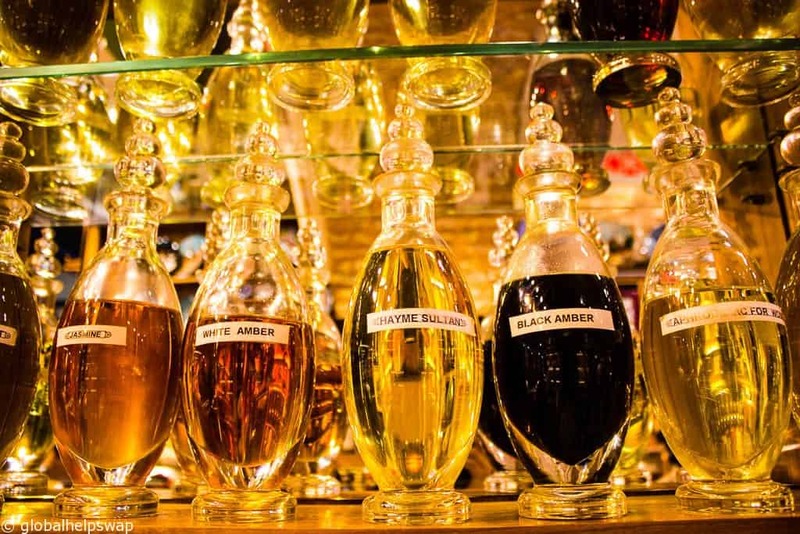 From ancient spirituality to a more modern form: Shopping! 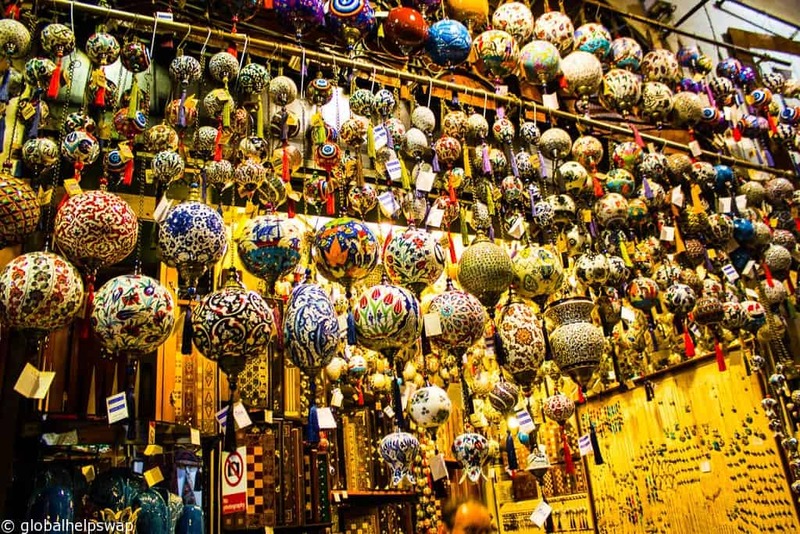 The Grand Bazaar is one of the world’s must see markets. With over 3,000 shops scattered around 61 streets, if you can’t find what you are looking for here, then they have not invented it! 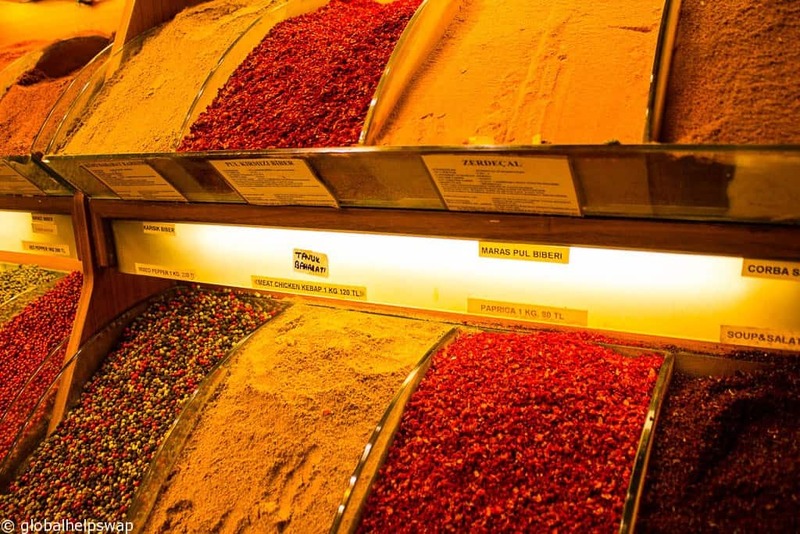 The market is one of the oldest on the planet and in 2014 was declared the number one tourist attraction in the world with over 91 million visitors. I am not sure how they can tell who is a tourist and who is a local but hey ho! What we found surprising was the lack of pressure to buy from the stall holders. They offered us in to see their goods and many offered us a glass of tea (be prepared to drink lots of tea!) but if we said no, there was no persistence from them. It was the opposite in Marrakesh, Morocco. There you would have to say no around 100 times before escaping! Kadikoy was our favourite area of the city and by sheer luck it was where our hotel were staying. 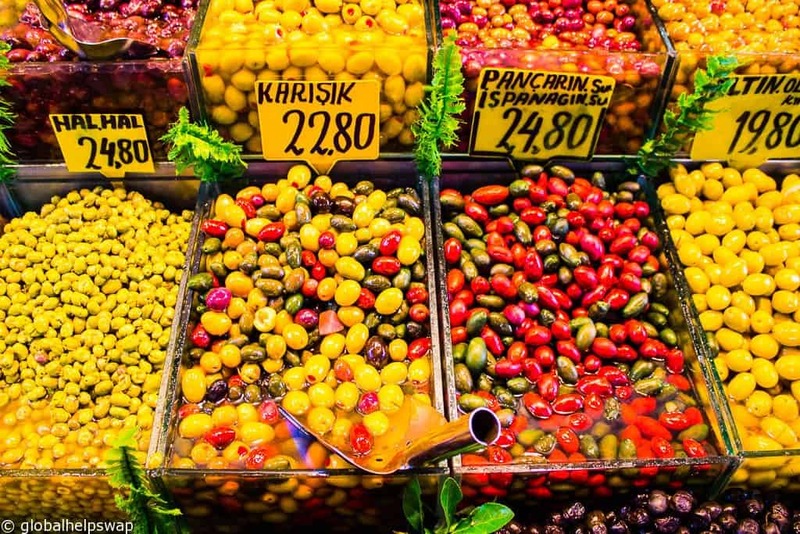 Situated on the Asian side of the city, Kadikoy is a lively bustling area with a wonderful fresh produce market, fantastic restaurants, hip bars and quaint little tea shops. Our friend Katrinka from Katrinka Abroad also lived in the area, another stroke of luck. 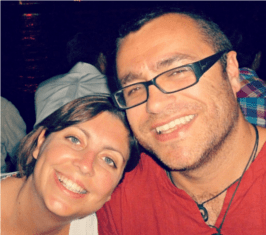 People think travel bloggers are organised when it comes to travel but we have to confess it’s not always the case. The more we travel the less we prepare and often just turn up at a place waiting to see what the day brings. Katrinka has lived in Istanbul for over a year so it was great discovering the city with a local. 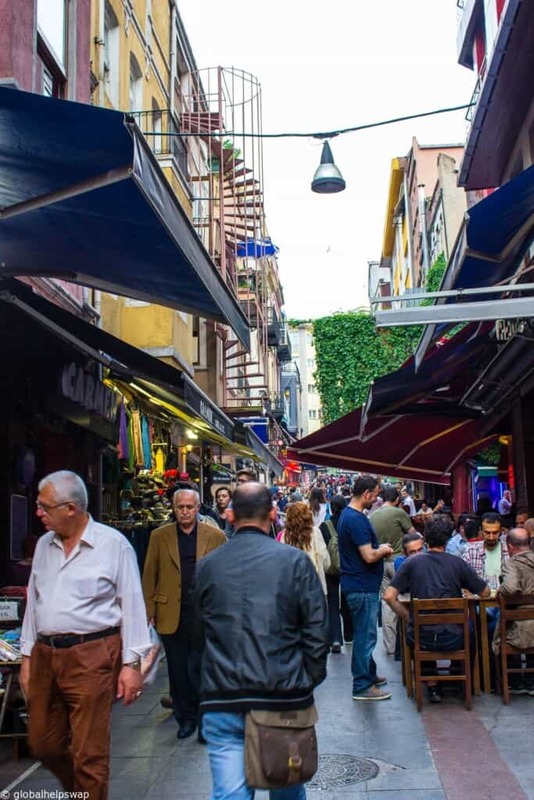 If you want to sample all the delights of the Kadikoy food scene and market, Walks of Turkey have a great Food Tour of the area, a must do for all you foodies out there. During our 5 days in Istanbul we never used a taxi, the metro or a bus. We travelled every day by ferry. Crossing between Asia and Europe every day was a great feeling. 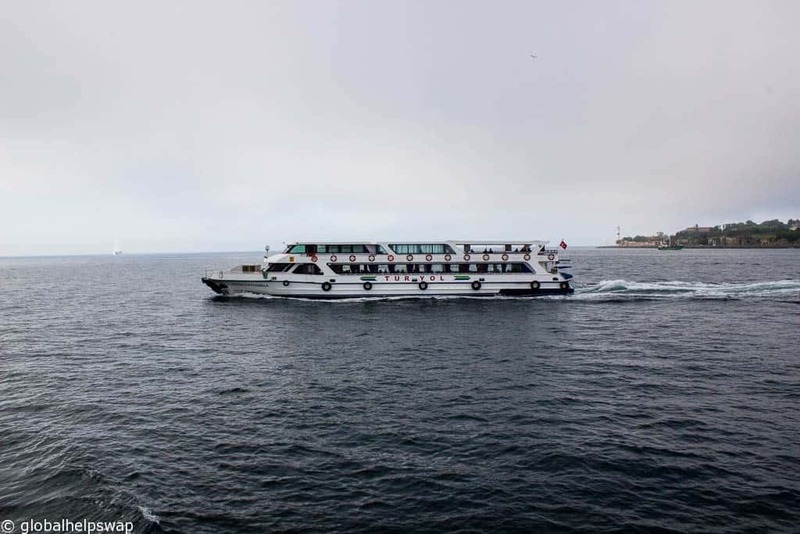 Frequented by tourists and locals alike, the ferries are highly efficient and run for most of the day. They are also a great way to see the city on the cheap. So find your nearest dock, jump on the ferry, grab yourself a cheap cup of tea and enjoy the sights! An area after our own hearts. 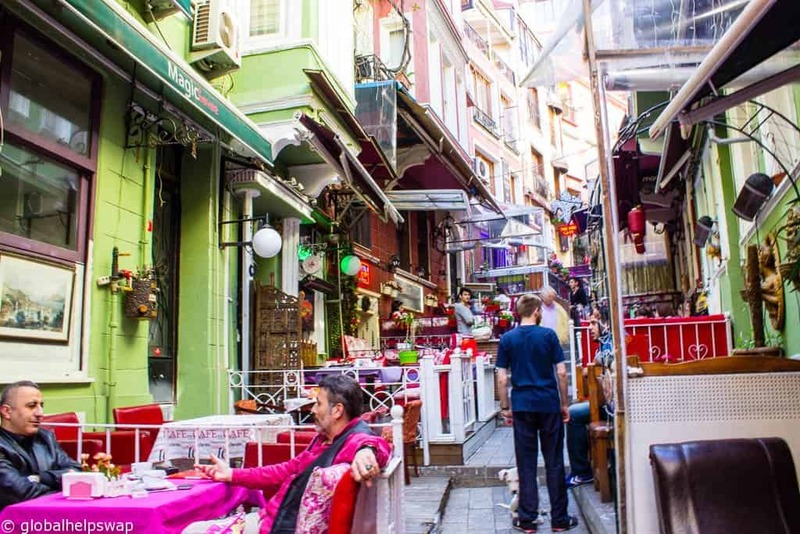 Beyoglu is an area full of writers, artists, bohemians and actors. 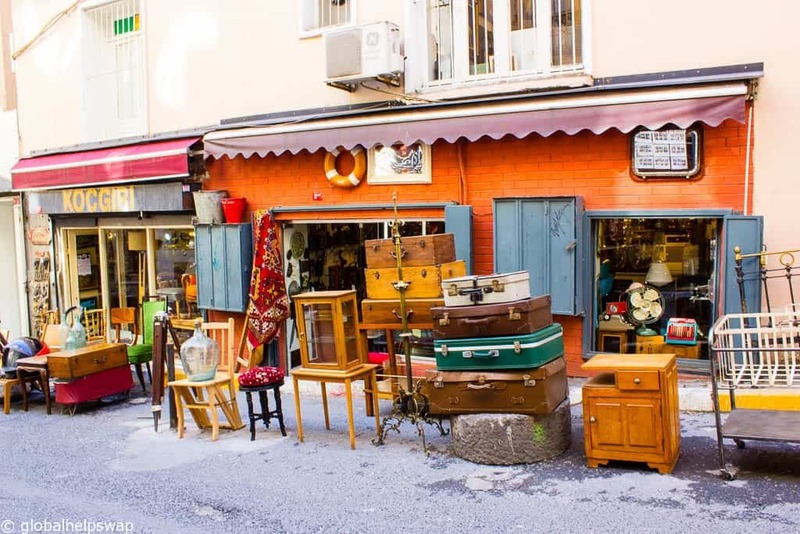 To satisfy the locals’ needs Beyoglu is full of galleries, shops, boutiques and hip restaurants. They say a new restaurant or bar opens here daily. 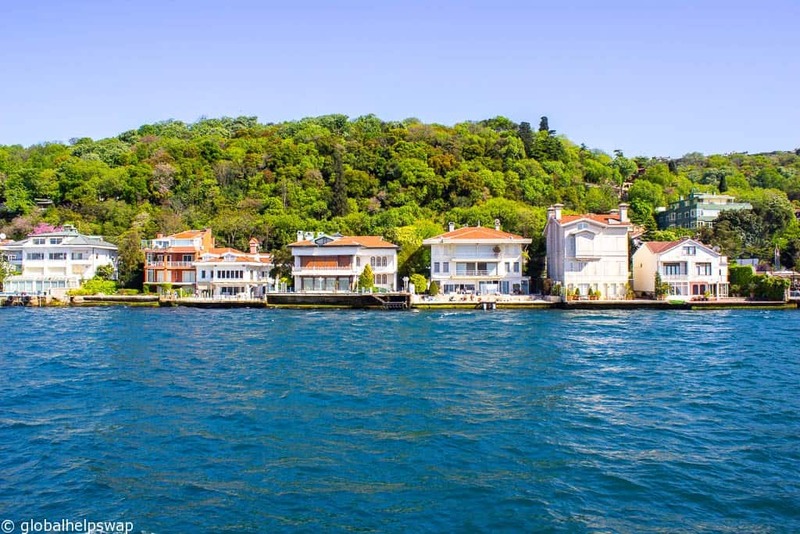 This is Istanbul at its most cosmopolitan and one not to miss. This photo was taken on our day tour with Walks of Turkey. It’s a gorgeous secret spot but we can’t reveal where it is. 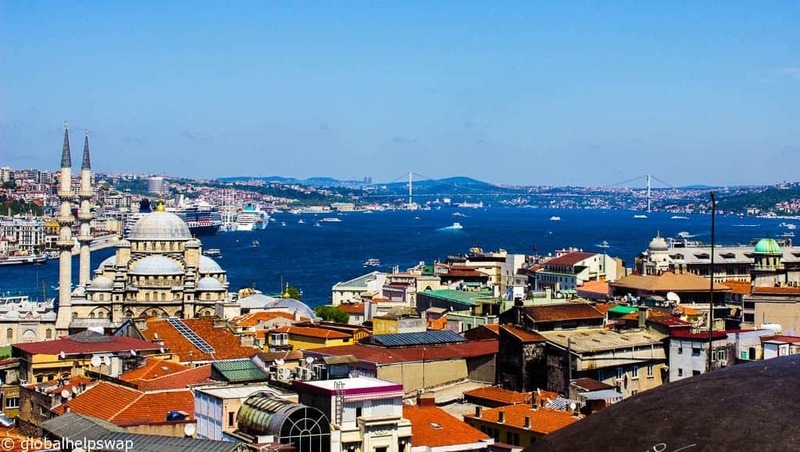 So if you want to see Istanbul in all its glory you’ll have to take a tour to find out! Have you been to Istanbul? What did you think of it? Finding Peace in Mardin – My first visit to Turkey was to a beautiful town on the Turkish/Syrian Border where I found it’s not all about war and destruction. Barcelona Sightseeing by Bicycle – Another favourite city of mine. This time I discovered parts of the city by bike. 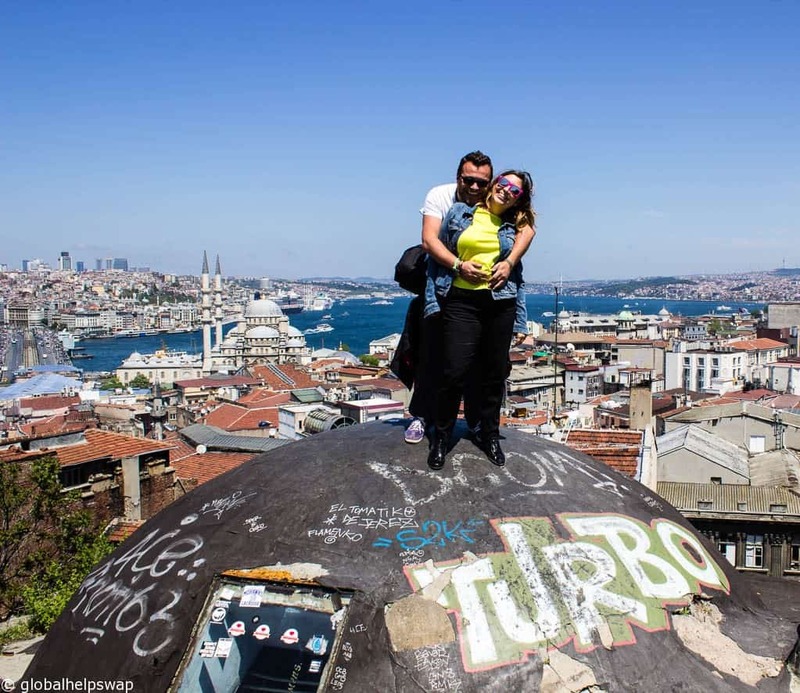 Thanks a lot, guys, for sharing your happy memories about gorgeous Istanbul! I’ve been there in June and got a bit frustrated of it, because I couldn’t organize my exploration of Istanbul as I wanted. Maybe it sounds strange but for the first time my COUCHSURFING experience spoiled my impressions from the city. My host was really jealous and insisted on spending all the time together. I felt that I owed him for his hospitality and couldn’t reject his generous offer to show the city. As a result, I saw at least 10 Mosques except Blue Mosque because, on my host’s opinion, it’s always overcrowded and just looked at Aya Sofia outside, because he didn’t recommend to go inside and said that he new better places. Finally, I spent two days running after my host and keeping my eye on him in order to not getting lost. Apparently, it would be better to get lost and find my own feeling of this great city. By the way, I love couchsurfing and I hosted many surfers in Moscow from all over the world but I never persuaded them to do something. If they needed me I helped them but if they were more about independent explorers I was happy to meet them in the evening, share meals and culture traditions. Thus, reading your post, I have figured out that I have to come back to Istanbul and find its spirit on my own way. Thanks for the comment Pam! Yes, you will have to make it but still keep getting lost too! Hi Nadine, thanks for your comment. Sorry to see you had a bad experience. Yes, go back and discover the city on your terms! Can you tell me where is the hidden spot? Thanks for the comment. I can but you will have to e-mail us as we promised our guide not to put it “out” there! It is, we love it.